Do you want to dress up as Abraham Lincoln, Vampire Hunter for Halloween? Excellent choice! Let's find a frock coat and top hat. 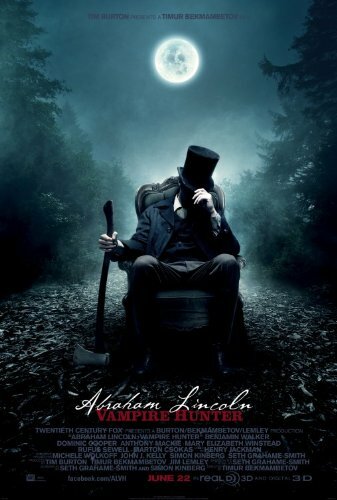 Abraham Lincoln, Vampire Hunter is a 2012 movie (based on the book of the same name) in which Abraham Lincoln, in addition to being a US president, also has an secret life as a vampire hunter. Benjamin Walker plays Abraham Lincoln in the movie. We think Abraham Lincoln, Vampire Hunter is one of the best Halloween costumes for men this year. You get to wear a cool black period costume and wield an axe. So what does the Abraham Lincoln: Vampire Hunter outfit look like? Let's take a look at the movie poster to remind ourselves. During the movie Benjamin Walker plays Abraham Lincoln at different ages from a young man through to president. We also see Abe in his formal role and president, and as an axe-wielding vampire hunter. The movie is produced by Tim Burton so we get some of Tim's flamboyancy mixed in with period costume. As you can see from the poster, Abraham Lincoln's iconic stovepipe hat makes an appearance. Abraham Lincoln is also known for being an accomplished woodcutter, so it's only natural that his weapon of choice for fighting vampires is the woodaxe! When putting together an Abraham Lincoln: Vampire Hunter costume, a good place to start is a historical Abraham Lincoln costume. This will make your character instantly recognisable. I've included a couple of Abraham Lincoln costumes below, and it's also worth looking for Abraham Lincoln costumes on eBay. This Abraham Lincoln costume includes a jacket with shirt front and attached and tie. You also get the instantly recognisable stovepipe hat and an Abraham Lincoln mask. Note that this costume does not include pants, just wear with a pair of plain black pants. This Abraham Lincoln costume does include pants and has a thin necktie instead of a bowtie. You may want to add a more flamboyant cravat or scarf to the costume for more of a Tim Burton look. An Abraham Lincoln costume is a good starting place, but it's the Abraham Lincoln Vampire Hunter look we're after here. The crucial prop to add is a Woodman's Axe. If you're creative and have the time then you could make your own woodaxe prop. 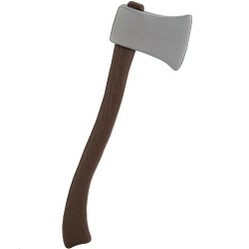 Alternatively you could go with a cheap kids toy wood axe like the one on the right. You'll definitely get the idea across. 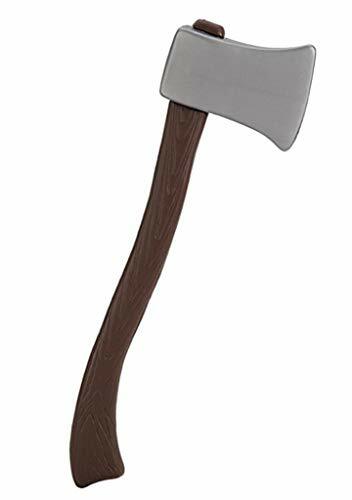 Or you could choose a horror movie wood axe prop which is likely to be larger and definitely more scary! It will be obvious that you're not just dressed as Abraham Lincoln the president who was also a woodcutter. Of course the giveaway that you're Abraham Lincoln: Vampire Hunter will be what you do with the axe. You're going to want to practice your vampire slaying moves. For a touch of flamboyancy you'll want to add a period long cloak or cape to your Abraham Lincoln costume. 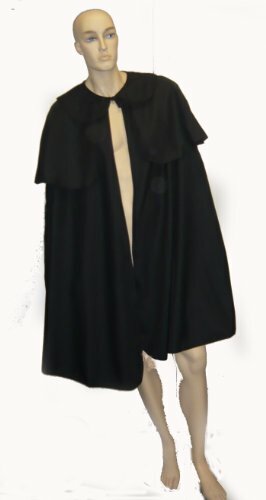 This cape is 40 inches long measured from the shoulder to the hem. This really adds to the dramatic effect. You can swirl and swish as you slay vampires - there should be plenty around at Halloween! Or you can look for men's Victorian frock coats and capes on eBay to put your own Abraham Lincoln Vampire Hunter costume together. As long as you go for a long black coat or cape with a waistcoat and necktie, and add a black stovepipe hat, you can't go too far wrong with the Abraham Lincoln look. Do you like the Abraham Lincoln: Vampire Hunter Costume ideas?